I first met Judy by name only in the list of winners and honorable mentions of a Writer’s Digest yearly poetry competition. We were both in welcome positions closer to 1 than 100. New to southeast Ohio, and the mother of three young children, I was in desperate need of a writing group to sustain my practice and stretch me in new directions, and quite honestly, starved for deep, grownup conversations. 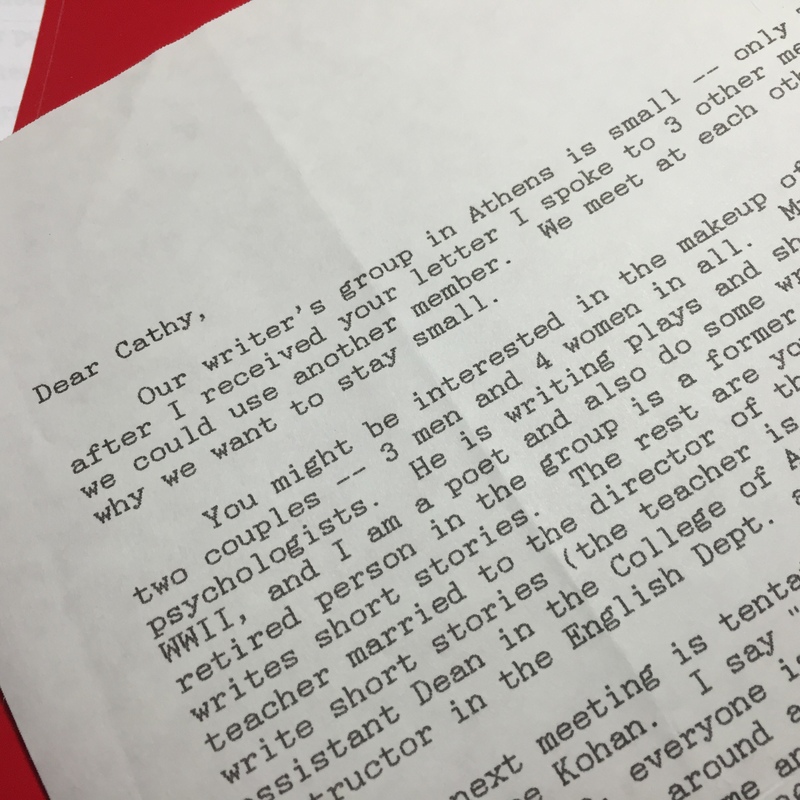 In a moment of bravery, I wrote to the judge of the contest who I knew taught at a nearby university, and asked if he could connect me with any local writers. Graciously, he responded, putting me in touch with Judy who also miraculously lived in the same university town. 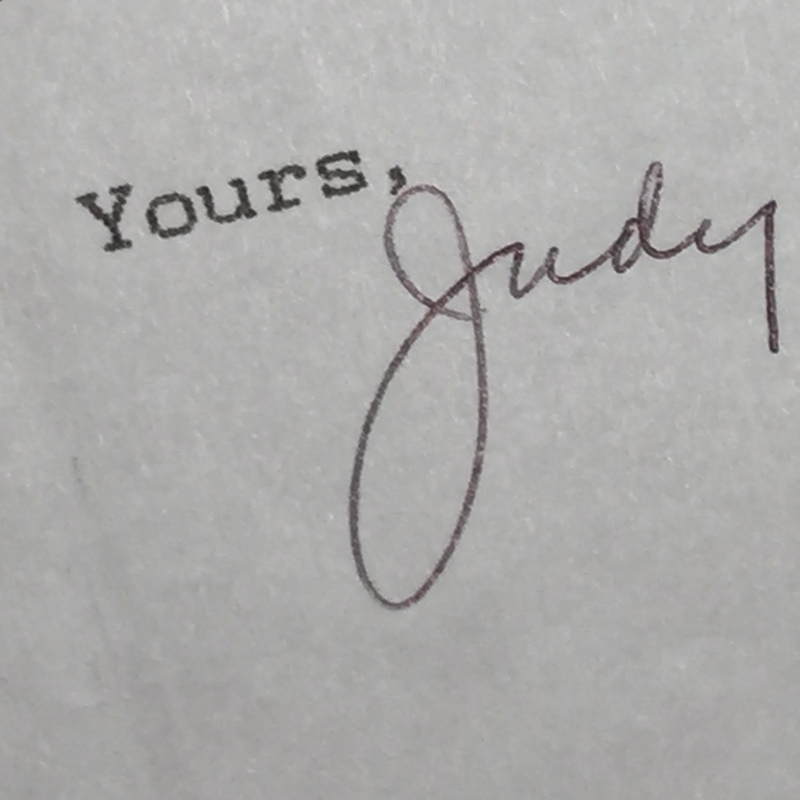 Judy wrote me a cautiously encouraging letter, congratulating me on my place in the contest and offering a tryout visit at the group’s next meeting. I was of course delighted, and terrified, but went anyway, and after sharing my work and some group discussion was made an official member. I found out later that this was a rare feat to enter into this group. These folks were serious about the mix of writers and their goals. So much of what I have accomplished and learned is due to Judy and the rest of the group taking a chance on me and seeing something of value worth nurturing in my writing. One of my first thoughts when I heard that Judy had died was that I wouldn’t get to share my book of poetry with her when it comes out this spring. I have folders and files, letters and notecards, with her scrawls across my poems, taking me to task for a general word when a specific word was called for. What bird? Not a bird. What specific bird? What specific car? What exact shade of red? You’ve said too much here. Let the reader contribute to the poem. Here’s the real ending. Without Judy, and my writing groups (there are several now), I would not have accomplished what I have nor have the hope of accomplishing more. Writing is a strange calling, one perhaps best suited to introverts and those who have no problem spending long periods of time alone. I crave that alone time with my creative pursuits. Most creative people do. But… (sorry, Judy)…we have to find the balance between separation and connection. Without connection, writers have a limited vision of the world, and no idea if what they are writing matters at all. Yes, it’s wonderful to create for yourself, but there comes a time when you have to let the reader, the listener, the person in need of a poem or story, finish the tale. When my little book of poems, Getting the Mail, was accepted for publication in November of 2015, I was again delighted, and terrified. Most of the poems had been published in literary journals and most likely read by about ten people. Lovely, and safe. But a book would be marketed, would be seen on store shelves, on bookseller websites, would have a life beyond me and my little corner of country life. Isn’t this what I had been working toward all these years? Of course! But there is still part of me, of many creative types, that is happiest in sweatpants with a cup of tea, a snoring dog nearby, a spiral notebook and pen with which to play with words all morning, and possibly to get so entranced that I forget to eat lunch. Sometimes, though, you have to be brave. Put on real clothes. Enter the contest. Write the letter. Send out the poem. Send out the whole damn book come what may. But most of all, find your tribe. Your people. The ones you can count on to scrawl love notes and questions across your pages. Across your life. And be that person to the next creative person waiting in line. There are no winners and losers here. Only those with a dream who at the end of their lives can say I followed my heart and helped somebody else do the same. « Self-editing or Editing the Self? How beautiful to be part of something bigger than ourselves. Although I didn’t know her it seems that Judy will live on in her individual work as well as through the lives of those with which her roots are interwoven. Beautiful sentiments my friend. Lovely post. I can’t wait to read your book of poetry and have you host The Sunday Dinner Blog. This is a wonderful post, Cathy. Looking forward to reading more of them in the future.